Are you down with the Abbey? 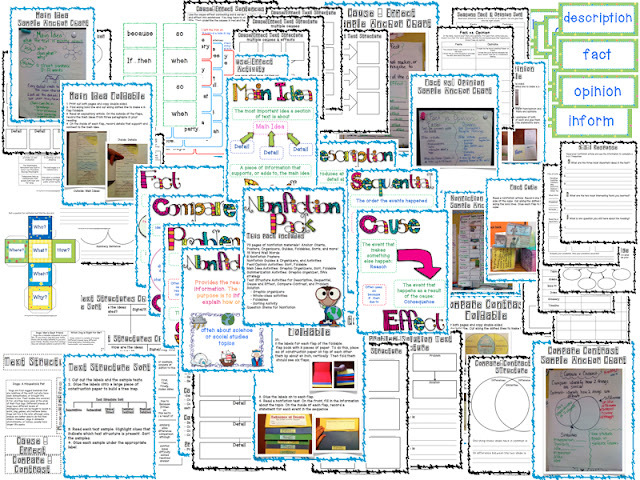 I've been trying to be very good and post about instruction. But today, it's just not gonna happen. My hunny worked late, so I spent the evening trying to Zumba at my sister-in-law's house. I figured I have to fit into some sort of a wedding dress sometime by October (why don't I just by a larger size dress?) and I thought it might be good to do some dancing-based exercising. This was a bad idea. There was no actual dancing going on. There should have been dancing. The people on the screen were dancing. I was not. I was jiggling and sweating and doing any number of odd gestures to try to mimic the very attractive and ethnic dancers on the screen. But no. I'm sure I burned some calories, but it wasn't pretty. Anyway, after I left my bro's house, I trucked it home - this is about a two-minute drive, thank goodness, because they bought a house several streets away - love it - and decided to catch up on the Abbey. Downton Abbey, that is. If you don't watch Downton, you might be kind of bored from here on out. That's pretty much all I'm going to talk about. Of course, I will put my spin on it, so you might get a kick out of it anyway. Heads-up: SPOILER! of season 3, episode 2. I say this, despite having the episode spoiled for me by enthusiastic friends' facebook posts. I totally get it. With issues this big, you need an audience to reflect. So I sat on my couch, filled up my glass o' wine (several times, to be honest) and pushed play at pbs.org to watch (I'm ashamed) Downton Abbey: Episode 2 of this season. I know. I'm behind. Anyway, I spent the first several minutes badmouthing Edith on facebook. Seriously?! I said. I didn't realize it was possible for Edith to be more annoying, but it is! Lay off the cheese, Edith. "He thought his life was over, but now he finds it is only just beginning!" Barf. And then it happened. He left her at the alter. I'm sorry, Edith. All the things I said are true. (You're super cheesy, ok?) But I do feel bad that I posted them. He left yuo at the altar?! How crappy! That's. So. Wrong. So I spent the next several minutes feeling a little guilty. She handled it about as well as I would have. By which I mean she spent the next couple days in bed. Anyway, when my hunnybun came home (three glasses of wine later) I told him about the episode while staring at him aggressively. "And he left her at the altar!" I said. I then informed him that he better really consider the consequence of such an action. Cause they won't be pretty. "Oh, hunny," he said. "I love you very much." BTW: I really don't like any of the sisters very much. 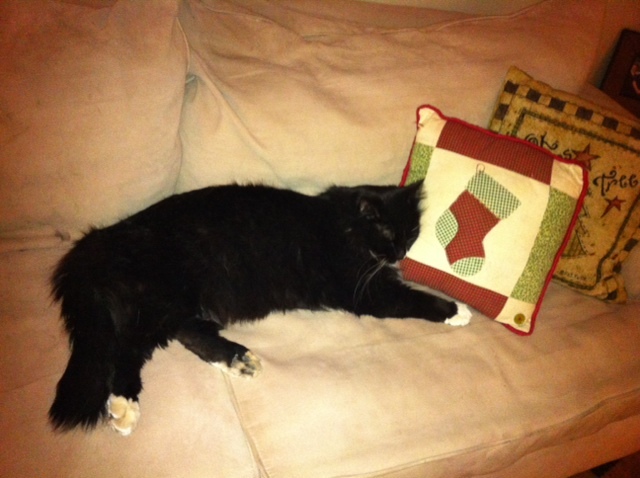 But I do like Granny, Ms. Hughes, Mr. Carson, and I looooove to watch Thomas, even though he's a big jerk. Do you have a favorite sister? Or just a least favorite sister? My least favorite is (still) Edith. You know when you notice your kids do weird stuff when they read to you? But then you're not always sure what to do about it? Yeah, that's a common problem. Sometimes, at the beginning of a lesson, we say, "Today we're going to practice making predictions". And the kid looks at you like, "Well, that's great." Then you say, "So let's look at the cover. What do you predict will happen in this book?" and the kid goes, "I don't know. I don't know how to make predictions. You might want to explain this a little more thoroughly if you actually expect me to do it." Ok, so kids don't actually tell us that. They usually give us a blank stare or something. But that's the truth, right? We ask kids to do this stuff without explicitly stating how to do it. That's why I created my "Good Readers" statements. 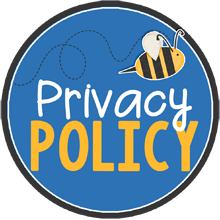 They are written to explicitly but briefly introduce the strategy we want kids to use. I wrote statements for comprehension and decoding strategies. And guess what? You can download them for free! 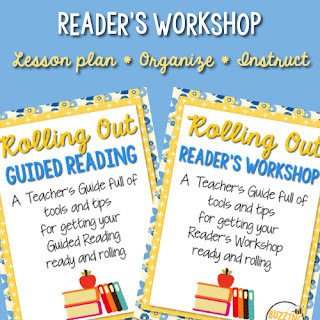 Just head over to my TpT store and download it as part of the Rolling Out Guided Reading Freebie. 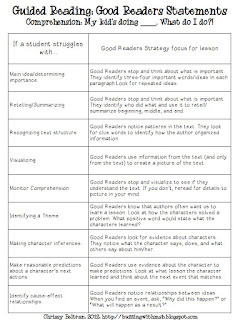 For example: Good readers make inferences. This statement doesn’t tell the student what to do or how to do it. 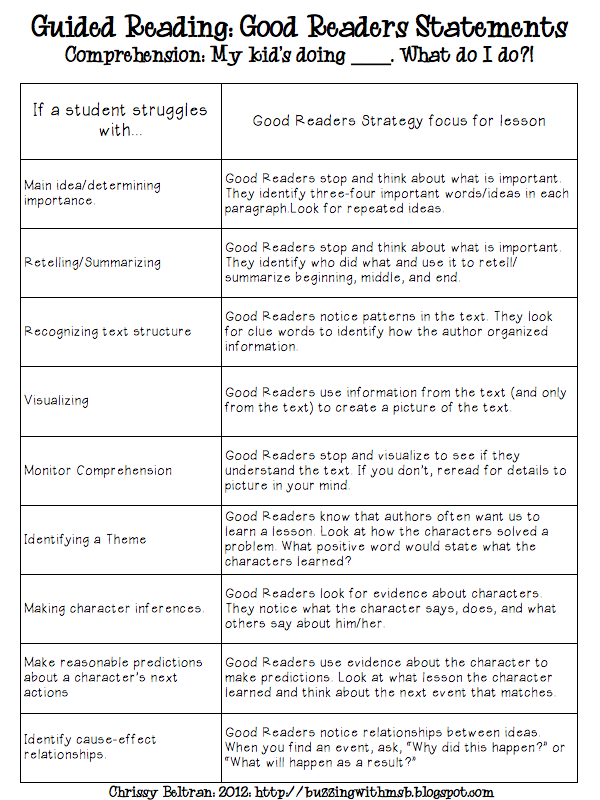 Good readers read closely for evidence about characters and think about what it means. This statement includes a specific directions for the student to complete. 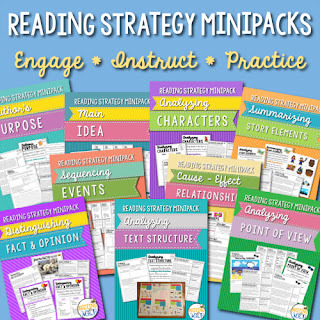 You can get the "Good Readers" statements as a part of a free download! 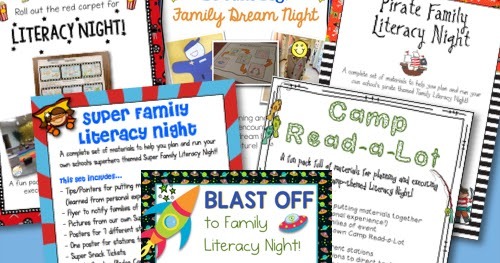 Just enter your email address below to get freebies and tips for guided reading. This is the third day of my main idea posts. Can you tell we've spent a lot of time on this idea? Her'e a strategy to practice main ideas. I've used it during Guided Reading. 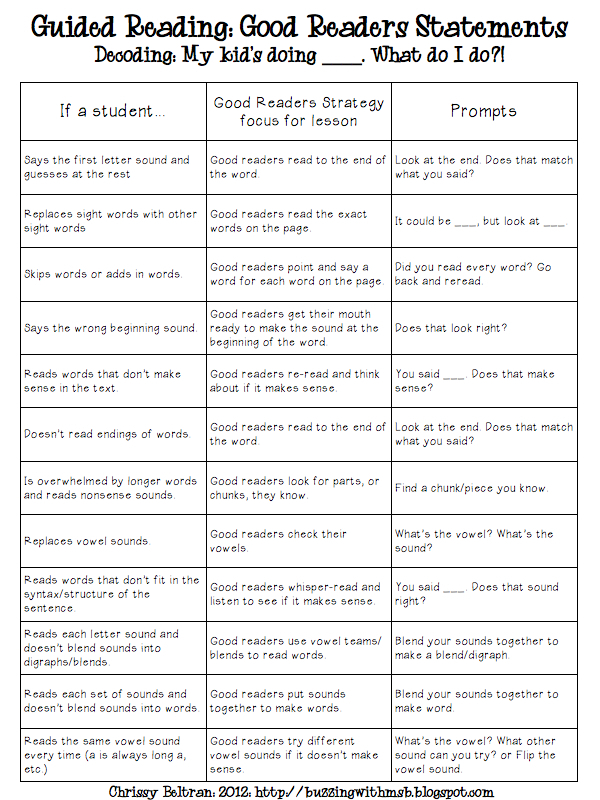 One of the nice things about our textbook adoption (not a big textbook user, BTW) is that it came with these leveled readers to use during guided reading. 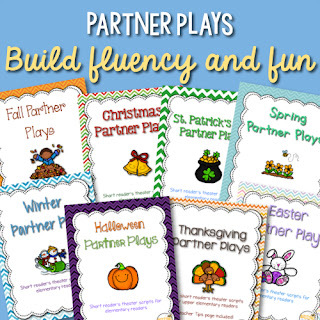 There are all different genres, too, so it actually supports our standards. I was working with a group of fifth grade kids when I did this lesson, but I've used it before with third and fourth graders. 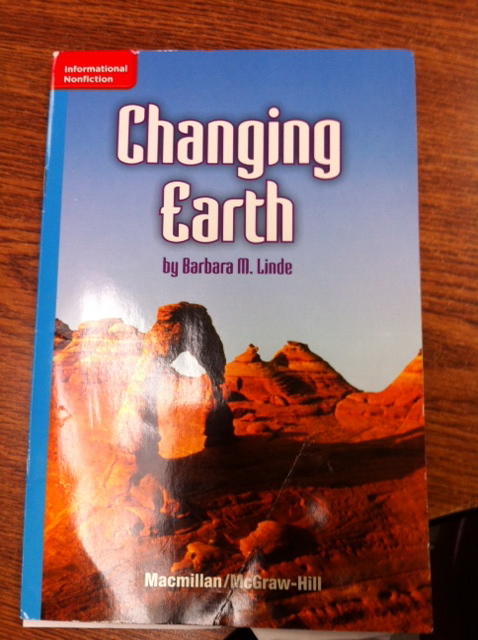 First, of course, we previewed & predicted about the text. This book is all about changes on Earth caused by different forces: water, weather, and plate movement in the Earth's crust. In our small group, each child has a book and a post-it. We look at a paragraph at a time. 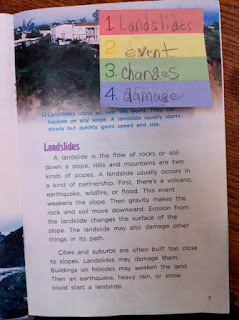 This page was all about Landslides, as you can see by the heading and photograph/caption. I want kids to start using the features to predict what the section will be about, so we have a conversation. Then I have each student read on his/her own, but seated at the table with me. As they read, they are instructed to find the 3-4 words that the paragraph is mostly about and record them on their post-its. After each student has recorded his/her words, we talk about which words we chose and why. 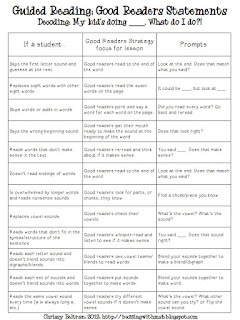 This is an opportunity for students to revise their words. For example, while we were reading a paragraph that included a list of characteristics of weather, the words hot and cold came up. A couple students wrote "hot" and "cold" on their lists, using up two of their four words. Another student, however, wrote "temperature." This idea incorporated both hot and cold, as well as several other sentences in the text. Kids can become more evaluative in their choices and really think about determining the most important ideas represented in the text. After kids get good at identifying the main ideas of paragraphs, we move into sections. 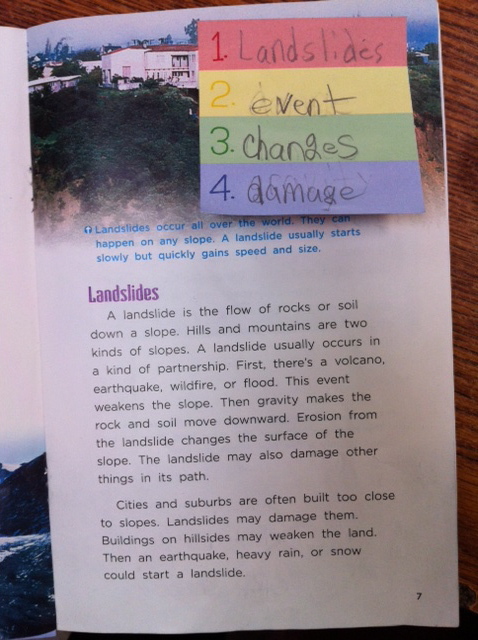 Then, they write a main idea statement for each section and combine them to create a summary of their reading. 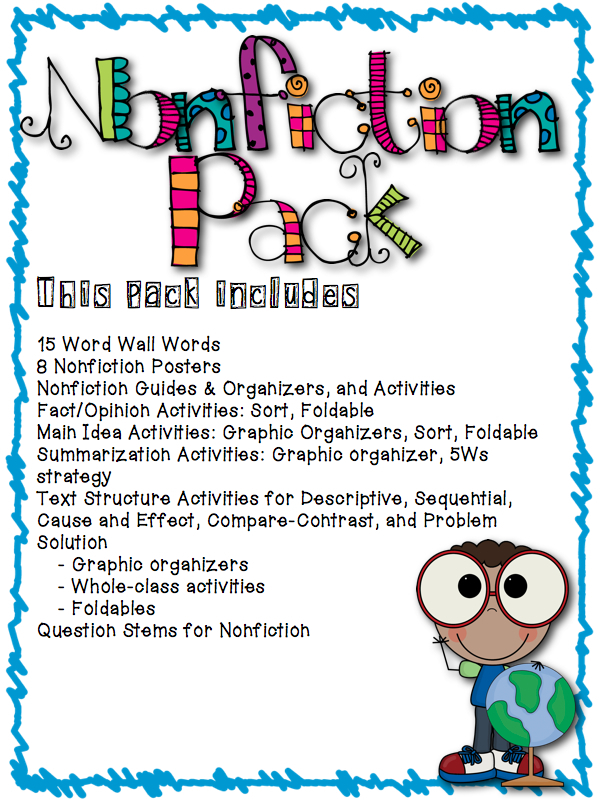 New on TPT and Teacher's Notebook, my ginormous Nonfiction Pack! I'm so excited about this pack. 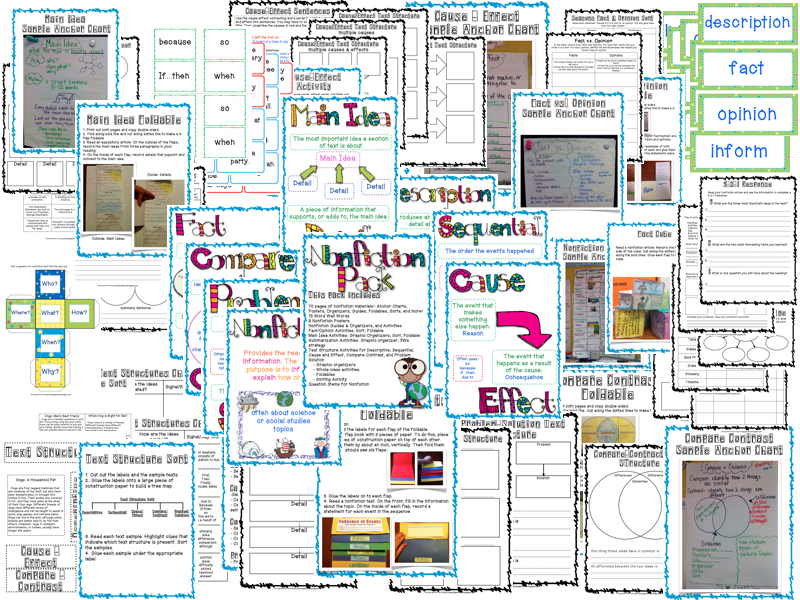 It's my biggest pack yet: over 60 pages of Nonfiction stuff! 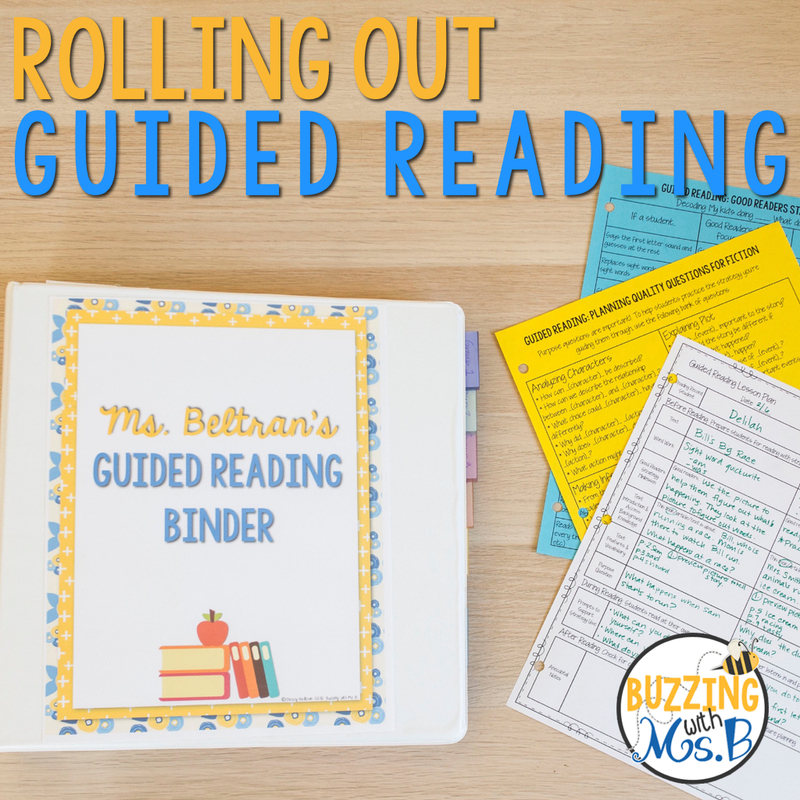 Check it out at TPT and Teacher's Notebook! Nonfiction: If I say it ten times, it's probably IMPORTANT! 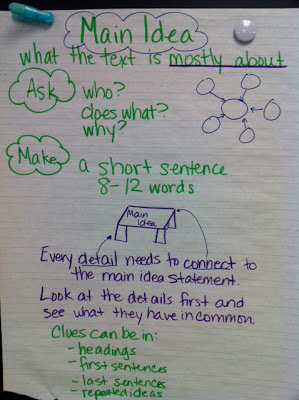 Yesterday, I shared a sample anchor chart to use for main idea. One of the tips to find main idea was to look for clues in repeated ideas. This is huge. If you think about how we find the main idea, we really have to consider repeated ideas as important. If an author takes the time to repeat, restate, or reference an idea over and over again, it's a big one. It's also important if there are many pieces of evidence/reasons/examples that connect to it. But this idea which makes sense to adults can be very abstract to little people. Here's a strategy to use to introduce finding main ideas. You take a song - I chose Octopus's Garden. I'm not sure why. It was literally the first song that popped into my brain when I thought, "What song shall I use?" Here are the lyrics. If you read through the song once, you get a general idea of what the song is about - An octopus's garden. But to create a more complete main idea, you read closely and notice what's repeated. In many songs, the chorus is repeated - it's the repeated part of the song where we get the big ideas. In this song, this is what is repeated: "I'd like to be under the sea in an octopus' garden in the shade/with you." It is specifically about the author's feelings towards the octopus's garden. The repeated chorus gives us an idea of the main message/idea of the song. In addition to this, the other verses support the chorus, or main idea. Why does he want to be in an octopus's garden? Several reasons. 1. No one there to tell us what to do. 2. Girls and boys know they're happy and safe. 3. We'd be warm, below the storm. The other verses support, or provide reasons/examples for the repeated main idea in the chorus. Nice, huh? Main idea is so important. Not just because it's a little skill kids need to answer questions like "What is paragraph 3 mainly about?" because that's not a very good reason. 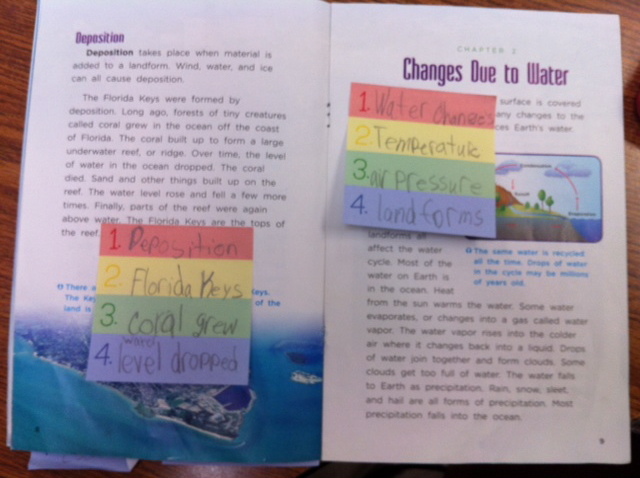 It's because, in nonfiction text, if a student can't identify what's important, they aren't determining importance! They're focusing on what's interesting rather than important. Interesting is ok when reading for enjoyment, but if we're reading for information - a vast amount of our adult reading time is spent reading for information - we need to be able to glean what's important on a large scale. 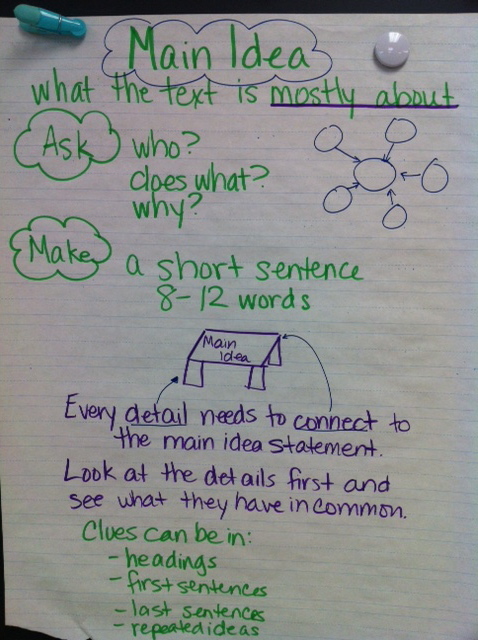 This is a very very simple anchor chart we've used with kids to help them think about main ideas. I like the "Clues can be in" section because repeated ideas are often very important. There's a reason why the writer chose to repeat that idea/word/phrase so much. IT'S KIND OF A BIG DEAL! So that can be a big clue. Our school has spent about a month in an expository unit already, and a lot of the grade levels are currently working on text structures. The structures that third grade works with are sequential order and cause and effect. 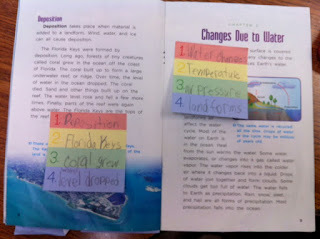 Fourth grade adds compare-contrast, and fifth grade adds logical order and classification scheme. 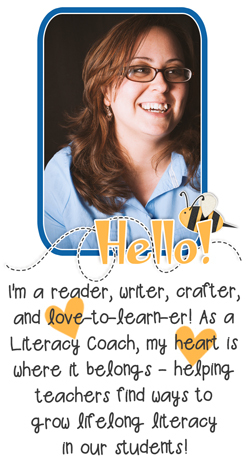 We have worked hard on starting with a tangible experience - something hands-on designed to have the kids notice patterns in language, etc., and then bridging to application in a text. We're trying to scaffold students' understanding of the ideas. Text structures always seems to be the key for students to really comprehend. I feel like students often read superficially, skimming and browsing through the text, but not really noticing or reading closely enough to consider the relationships between words in sentences, paragraphs, and the overall text. This happens in fiction and nonfiction, but it's especially difficult in nonfiction. 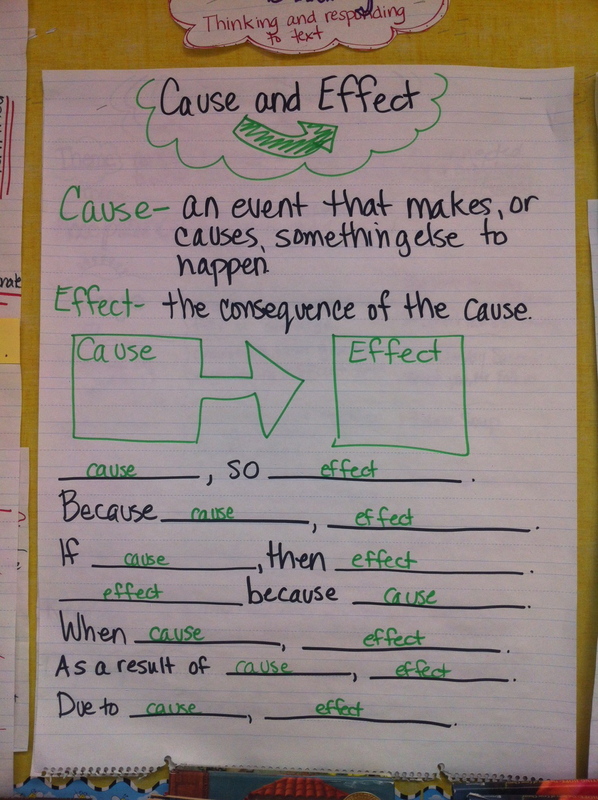 First, kids will recieve a set of cause and effect statements on cards. Each student receives a card. They mix-pair-share to find their cause-effect match. Then, in their partners, they use the sentence stems on the anchor chart to build sentences including their cards. My favorite part is the sentence stems on the bottom. We're trying to get kids to use the stems in speaking and writing. We're hoping this will help them think about the relationship between ideas and how sentence structures contribute to that. One common misconception I've found with text structures is where we see them. 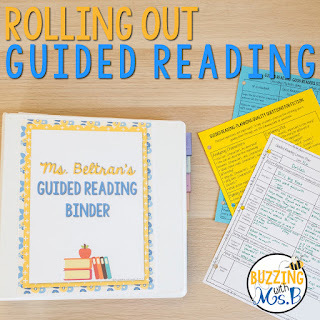 In the standards, it feels like the entire text will be a cause-effect structure, or a sequence, but in reality, it's usually a few sentences, a paragraph, or a section of text that are organized that way. Several different types of text structures can be used in one text. To help other teachers out with these topics of nonfiction, I've been working on a Nonfiction Pack that includes these activities as well as many others! I'm super excited about it - it will be my largest reading pack to date! I'll let you know when it's up! Out of the things that I miss about the classroom, I think math actually makes the list. (Science - no.) Math is fun to teach. It's so tangible. 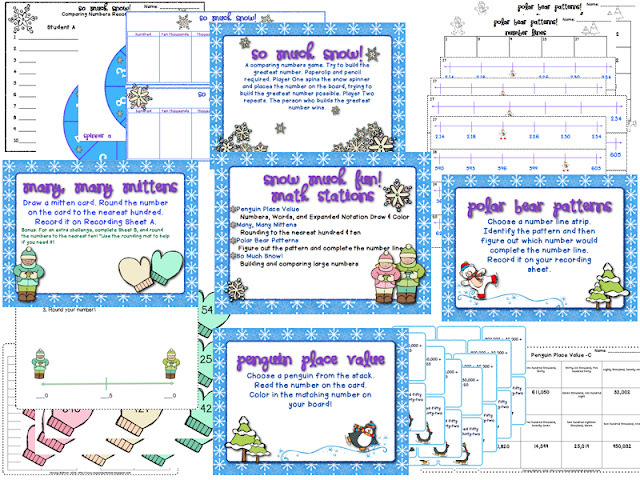 So to amuse myself and to help out my third grade teachers, I put together this math pack: Snow Much Fun Winter Math Stations! 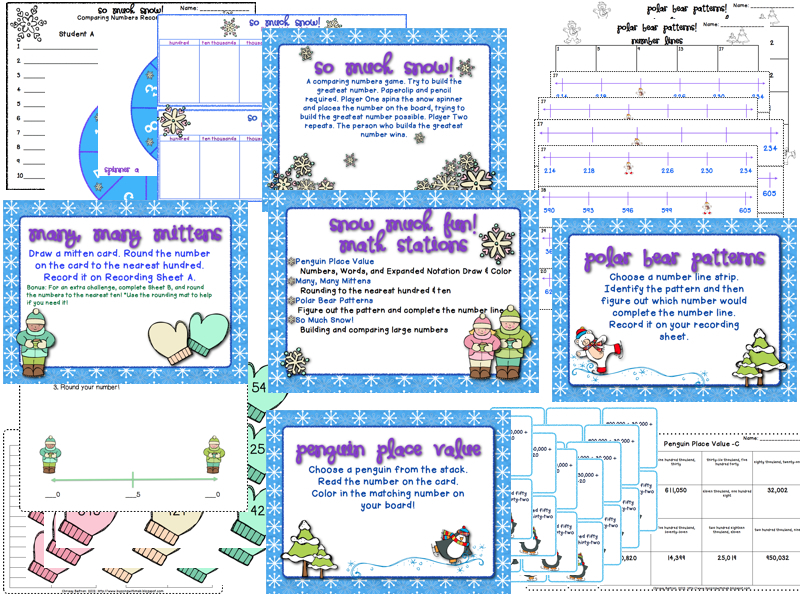 Many of the third grade teachers were saying their kids were struggling with basic number skills, and so I included number lines, rounding, comparing numbers, and place value in this math pack. Hopefully spiraling these concepts through math stations can help students retain the learning they did earlier in the year! To the first five comments (including your email address), I'll send the pack for free! Have a happy Saturday! One of the things our K-2 teachers are working on is increasing student accountability for comprehension. This can be difficult for students when practicing independently, such as in daily five stations. We found this adorable and simple strategy to use with kids to help them remember how to retell. 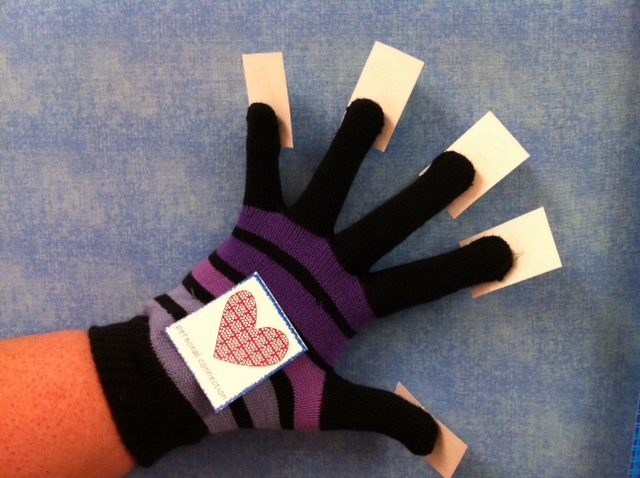 It's called the Retelling Glove and it's great for fiction. Our teachers got to make one today during an after-school meeting. They're super easy to make! You take a glove (they're on clearance now - I got a bunch of pairs for 50 cents each, and you only need one per class!) And you print out an image representing each item necessary for a good retelling. The thumb: a picture of people. This represents the characters. Pointer finger: a picture of a house/scene. This represents the setting. Middle finger: a picture of a lock. This represents the problem. Ring finger: a picture of a key. This represents the solution. Pinky: a picture of a ladder. This represents beginning-middle-end sequence of events. Palm: A light bulb. This represents the main idea. Back of the hand: A heart. This represents a personal connection the kids have. The teacher models using the hand to retell during a read aloud or shared reading. 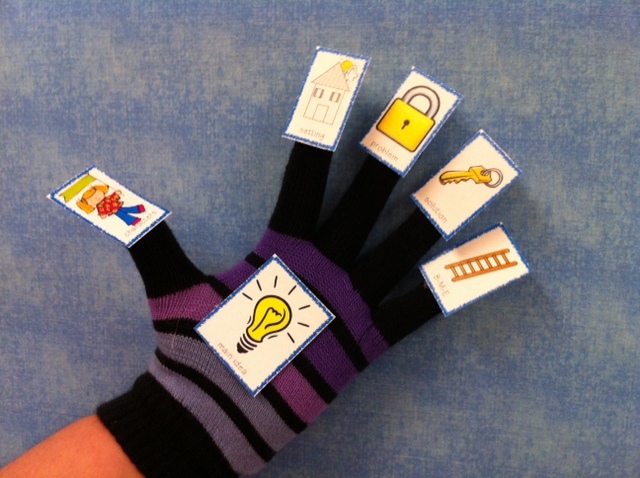 After the students have become familiar and received lots of practice, the teacher can put it in their read to self or read to someone station and have students wear the glove to retell. What a cute and easy way to encourage retelling and grow comprehension! By the way, I just started watching The Tudors today on netflix, and I'm super hooked. I don't want to go to work! I want to be a cat instead. I know I've been largely missing this break. I have enjoyed my time with my family and my hunny. Since he proposed, I've thought of nothing but wedding Wedding WEDDING! and I don't want to think about anything else. Tomorrow I go back. I really really really really don't want to. ("Who cares!" says everyone who went back last week) I think it's gotten worse since I don't have a class. When you have kids, it's different. You HAVE to be there. I know I HAVE to be there, too, but there won't be 22 helpless little baby boos missing me if I'm not there. It's very different. I was trying to motivate myself, but I think I'm just not going to think about it instead. 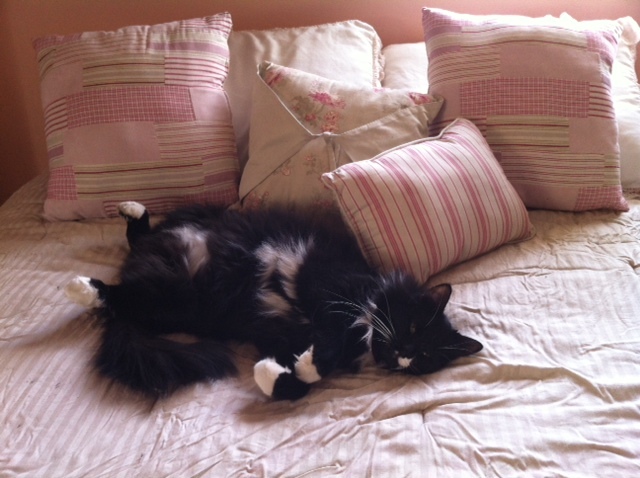 Instead, let's talk about what I would rather be than a human: a cat. 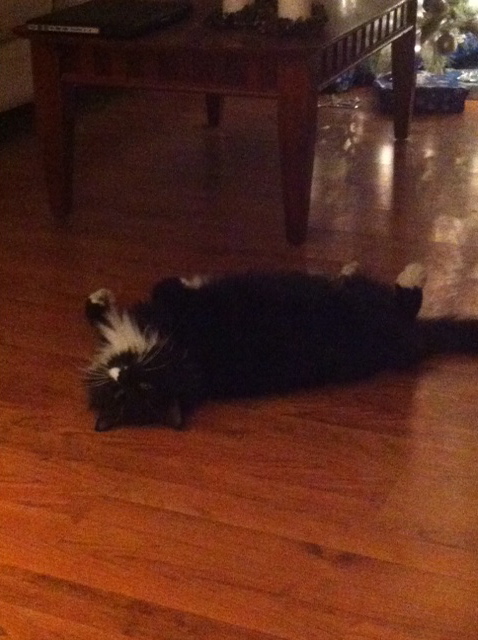 This break, I have had the pleasure of observing my cat, the Professor, and noticing how he spends his days. 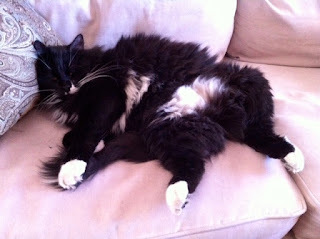 And as the days passed, I realized: Being a cat is awesome. It's not really contestable. 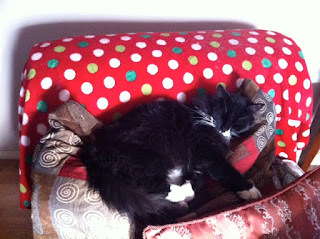 Here is my photographic evidence of what my cat does all day. Sometimes he lays on the couch. 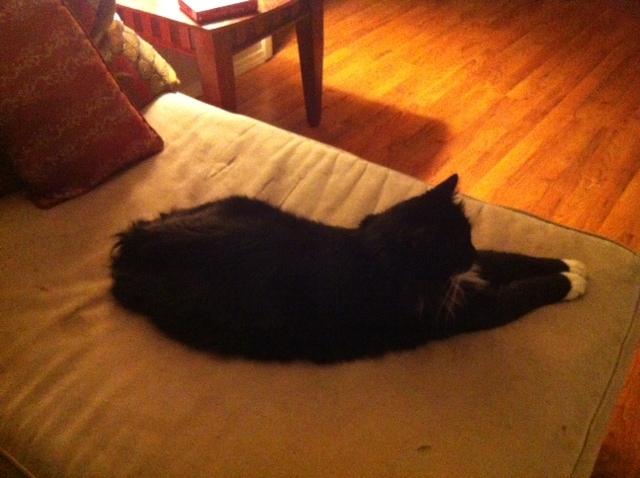 Other times, he feels like laying on the chaise. On some days, nothing will do but lounging on the floor, right in the middle of everyone's path. When he wants to be extra comfy, he smushes up all the pillows and lays on top. Guest bedrooms are pretty nice. And this is my favorite. I would like to say this was the morning after New Year's, but that would be too perfect.